U2 never seems to do anything small, whether it’s the stadium size 360 tour the last go-around or the implant of their latest album in the iTunes account of everyone in the world that has one. Though they’ve scaled down the size of venue for their current tour in support of their 13th album Songs of Innocence it’s still everything as big as you’d come to expect from the band. 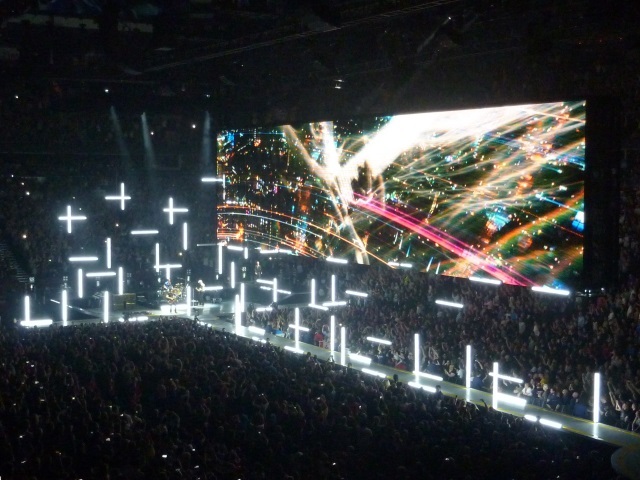 U2 opened their Innocence+Experience tour on Thursday in Vancouver, BC to a sold-out Rogers Arena, the first of two dates that kicks off a year-long trek around the world. By contrast, the Irish foursome ended their last tour in Canada, across the street at BC Place Stadium, a place four times the size of the current digs. Though nearly every conceivable bit of space is used in the stage configuration (full arena seating and general admission floor), the more intimate setting certainly fits the band well. 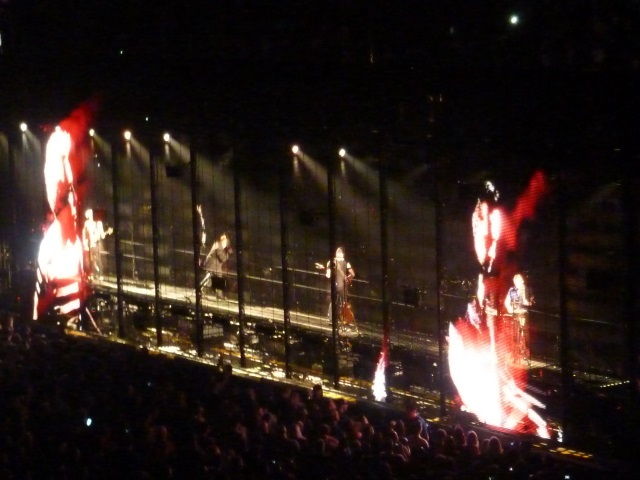 The main stage is featured at one end of the floor, with a long catwalk extending towards the other side connecting to a smaller round stage which makes an “I” (the main stage) connected to “e” the smaller stage, the logo for the tour. A basketball court length projection screen stretched above and nearly the length of the catwalk and the fun was just starting. Despite taking the stage 45 minutes after the scheduled start time (come on guys, leave the prima donna act to Madonna) U2 – lead singer Paul Hewson aka Bono, guitarist Dave Evans, aka The Edge, drummer Larry Mullen, Jr. and Adam Clayton on bass – put together a solid 24 song set featuring seven off the new album along with a dynamic stage show that was personal and demonstrative. The band walked to the stage to the Ramones’ “Beat on the Brat” so it was hardly a guess as to what they’d open with as The Edge fired off that grungy opening to “The Miracle (of Joey Ramone).” Once it got going though, Clayton’s bass guitar overpowered the song which unfortunately wouldn’t be the last time of the evening. From the latest album back to the first, U2 unlocked the vault for “Out of Control” off Boy now 35 years old but sounding as fresh as anything on radio today with those great hooks and a stellar solo by The Edge. “Vertigo” really brought the crowd to life which continued once that unforgettable introduction to “I Will Follow” the opening tract of Boy rang throughout the arena. Three straight off Songs of Innocence came next as lead singer Bono made his mom proud with his love song to her “Iris (Hold Me Close)” and he just nailed the vocals to the “Hold me close” chorus. Adding some emotional depth to the performance was an old black and white video, likely of Bono in his youth, projecting on the screen with a simultaneous video of Bono singing as if he’s looking back, reflecting on his life. 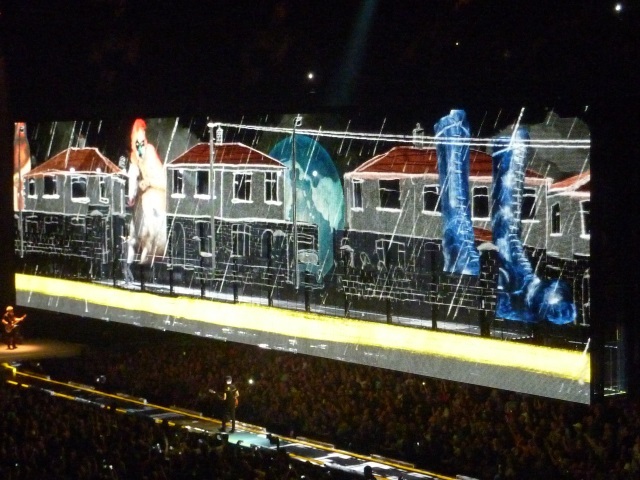 The giant screen featured a walkway down the middle so, as video projected, members of the band could in a sense, get inside the televised image. Bono used this for “Cedarwood Road” taking a trip to his old neighborhood in Ireland as he sang and animated houses streamed by him. The nostalgia continued with “Song for Someone” a nice nod to Bono’s wife Alice Stewart and then U2 got back to harder edge fare with “Sunday Bloody Sunday” as the band stretched out along the catwalk with The Edge on acoustic, and Mullin donning a marching band style snare drum. They slowed the pace of the song a bit and this version worked well. What worked even better was “Raised by Wolves” the fifth song of the night off the new album that absolutely shined and outdid the studio version. “Until the End of the World” followed and “Invisible” which brought all band members inside the giant screen simply fell flat. Overall, the music drowned out Bono’s vocals and again Clayton’s bass overpowered the speakers often sounding distorted. U2 set up camp for “Even Better Than the Real Thing” on the opposing smaller round stage where they stayed for “Mysterious Ways” and “Desire.” Bono played the harmonica part to “Desire” and then piano for “Sweetest Thing” which brought back The Edge on acoustic. Bono did not play guitar all night, something he said he might never be able to do again thanks to the bike accident in Central Park last November that resulted in damage to his eye-socket, shoulder, elbow and left hand. Clayton and Mullin left the stage as The Edge took piano duties giving the floor to Bono and the two simply killed “Every Breaking Wave” adding even more emotional depth to an already emotively strong song. It was everything “Magnificent” should have been on the 360 tour that never was. 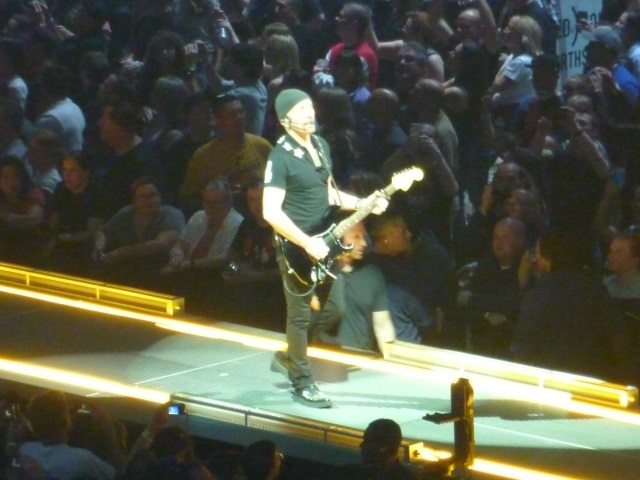 Considering the sound system used for the tour is supposedly state of the art, the band needs to iron out some kinks with the volume level on the bass and address other elements of distortion including adjusting Bono’s vocals that sometimes came off as muffled under the heavy bass and guitar chords. It was certainly far from ruining the first show as U2 played tight and delivered an energetic and well-though out performance. 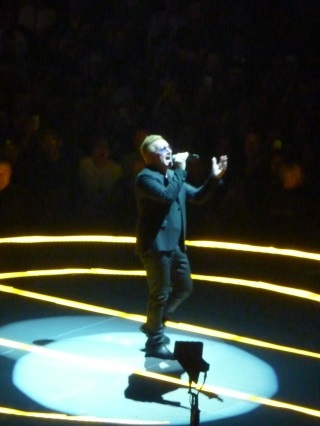 Bono, of course, is the ultimate showman, with an almost enchanting stage presence. He displayed no ill effects from his bike accident other than not playing guitar and he knows how to perform and engage the audience. He said fans can expect a different experience from Night 1 to Night 2 so it should be interesting to watch that play out as well in Vancouver as well as the rest of the tour. Sound issues fixed, sounded great. Same show except for variation on the setlist. Great write ups, Drew. I’m seeing 2 LA shows as well as the second San Jose show. Let’s see how those gigs fare. Thank you. Have a great time. I already want to see another.